The boxing scene is heating up, getting to a boil point, with two cards (DAZN, Top Rank-ESPN+) running Friday and then a PPV card (Pacquiao vs Broner from SHO) unfolding on Saturday. The news scene could be moving from simmer, too, with a news drop of where Gennady Golovkin is going to land. His trainer Abel Sanchez told us two months ago that he thought GGG would be going on the record with his plans in probably the third week of January. And guess where we are? I think that tracks with some of the developments we’ve seen in the last week or so. The main clue: Oscar De La Hoya went on social and said he gave his top gun guy Eric Gomez the go ahead to start negotiating the deal so we can see Canelo vs GGG 3. I messaged Gomez to ask about it, didn’t hear back. Yeah, that signifies something, though exactly what we will only know in retrospect. De La Hoya isn’t afraid to stir a pot, and also put something out there to seek to affect negotiations. Now, an announcement that indicates Team Canelo and Golden Boy are into a third fight with Golovkin seems on surface straightforward. But you know what? In areas such as this, “straightforward” is not always the norm. There will be back-and-forth and posturing, quite possibly, as a third middleweight showdown between the two titans gets coalesced, and who indicates a willingness to seemingly want the fight more could be an effort to set up a negoatiating posture. On the other hand, it wouldn’t surprise us if there were not so much heated rhetoric and negotiating playing out publicly as the trilogy bout gets made. Why? Because if conventional wisdom holds true, and Golovkin signs to DAZN, then he might just be getting a juicy pile of loot, without having to cut and scratch and such. And if that happens, then I think the terms, roughly, on a Canelo vs GGG third scrap are pre-set, and he would sign off on them quickly. In other words, a GGG to DAZN deal comes to the table with ingredients laid out, and is more of a two-step scenario then some other free agent deals. DAZN knows what they want to pay and what fight(s) they’d like GGG to engage in with folks on their rosters (which was fighters mostly with Eddie Hearn but now includes Golden Boy boxers as well), and that might mean the “making of” special regarding a trilogy bout could be short and sweet. Some might have read into GGG promoter Tom Loeffler’s hits at Dan Rafael and Mike Coppinger, because they rep ESPN and PBC. And if GGG isn’t signing to ESPN-Top Rank or Team Haymon, then it stands to reason Loeffler would be more inclined to take whacks at the ESPN guy and the PBC guy. Right? Not so fast. Coppinger is also a RING guy, and De La Hoya owns RING. So that sort of messes up with that theory. Plus, another guy he slammed on social, Mark Ortega, gets PBC money but also writes for Sporting News, which is part of DAZN family. Adding to the muddiness of this angle, we’ve seen a solidification of unity between DAZN and RING, and Golden Boy. So it maybe means nothing much for the conspiracy theorist crew that Loeffler went at Rafael, Copp and Ortega. You saw that solidification, maybe, a signal of it, when Eddie Hearn graced the November issue of RING. Issues are put out two months before their “month of” tag, so back in September, were plans of what’s next for DAZN and GGG and RING and Canelo and all them being formed and firmed? Only those players know for certain, but it can be fun sifting through clues! Now, have any of you unofficial Sherlocks seen other clues as to where GGG might land? Talk to me — what have you seen or heard, and how do you think this plays out? GGG signs to DAZN, his next fight is versus Canelo — and then what? Would they all structure a single fight deal or a multi fight? 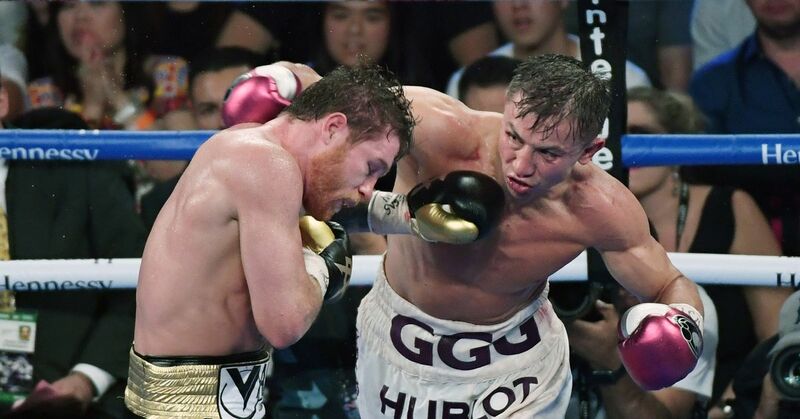 I’d think multi-fight, and allow Canelo and GGG to fight one interim fight before meeting again in September, but after the grumble-a-thon that resulted from Canelo vs Fielding, Canelo needs to fight an “A” foe next, right? You weigh in, friends. Woods, a Brooklyn resident, was a staff writer at NY Newsday, before joining ESPN The Magazne (2003-2011). He edited TheSweetScience.com (2007-20015), publishes NYFights.com, calls fights for Facebook Fightnight Live and does the “Talkbox” podcast for Everlast.